As a manufacturer you are constantly vying for the attention of consumers and, once you’ve got it, keeping it is just as important, but what should you be focusing on? What will bring you the most return on your investment? It goes without saying that the quality of your product is of the utmost importance, but how do you make sure that the consumer stops, takes notice and decides to give it a try? Your product label is the driving force behind the perception of your product, it is the start to your story, make sure it’s a start that makes them want to finish it. 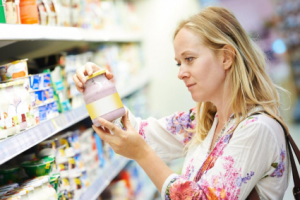 Avery UK recently conducted a study to gain an in-depth understanding into what factors, on a label, captivate the consumers interest and compel them to take the plunge. The study consisted of three different approaches, a laboratory eye-tracking apparatus to trace where a label can lead the eye, a series of online experiments to examine the psychological and behavioural aspects of purchasing behaviour, as well as reviewing previous studies and literature on the matter. The study showed that there are three psychological factors that need to be considered when designing your label. Its ability to appeal to a limited attention span, a capacity to talk to a consumer’s emotions and the provision of mental shortcuts to lead the consumer towards a specific behaviour. As an attention grabber, amongst others, the use of colour, bold lines and the positioning of both the label on the product, as well as the information on the label, all proved to make an impact on the consumers awareness. Simplicity is also key, with the overload of information bombarding us at all times, the more relevant and specific the information provided the more likely we are to give it attention. Using icons that are relevant to the product increases the chances of it being found quickly and simplifies the process for the consumer. When appealing to your consumers emotions, the power of suggestion is a valuable tool, the use of simple words like ‘love’ and ‘joy’ will subconsciously create a positive association with your product and using a high-quality label will provide the consumer with an increased level of expectation and excitement. When it comes to your label design, it really is the little things that count, the study showed that the use of handwriting font increased customer consideration by up to 30% and purchase intention by 33% and making it personal by either addressing the consumer directly or including a special message, further increased the consumers attention. Basically, a personal touch can be very effective in making a consumer stop and take note. But where to now, you’ve won the battle and your product was chosen, it’s in the hands of the consumer. You’ve spent time building their trust and you’ve succeeded, but how do you make sure that they remain loyal to you and your product while still growing your brand? Remaining relevant in this fast-paced consumer environment, while, at the same time, ensuring your brand becomes attractive to the next generation of consumers, is of the utmost importance. You need to be continuously developing your brand, adapting it to meet the new consumers expectations, but still making sure that it remains attractive and recognisable to your current customer base. When making any changes to an established brand you need to remember that people don’t like change. There’s a reason why there have been books written on the subject, why companies spend a great deal of time and money on ensuring their staff are equipped to deal with change, people need to be prepared and commit to the process and need a sense of stability. What this means is that when you’re making a change to your brand, a sudden, complete make over is not the way to go. An example of getting it wrong is when SAB changed the branding of Lion Lager. Lion Lager was first brewed in 1889 and was the SAB group’s biggest seller during the 70’s and early 80’s. In an attempt to appeal to the younger and female market, the brand was wholly revamped in 2000. The new product was lighter and lower in alcohol, gone was the iconic lions head, proudly positioned above the name, printed on a red circle with a gold background, to be replaced by blue and silver, without a lion in sight. In less than three years Lion Lager was off the shelves. A grave mistake to make in the competitive brewing industry, the loyal Lion Lager drinkers, feeling alienated and abandoned, were warmly welcomed by their competition. It was simply too much and too soon. A great example of a brand that has managed to get it right is Coca Cola, who have retained a fiercely loyal customer base. Worldwide it remains one of the most recognisable brand’s, after 125 years no less, and although, over time, there have been many adaptions, they have retained their essence, the classic red and white, recognisable in any language, with the bottle shape, even if it’s printed on a can. As a lesson in loyalty, there are a number of points to take note of. When choosing your label design make sure to include a timeless element, that has the ability to grow with your brand, is adaptable and that can become your brand’s signature. Remember your customer base when making changes and that change isn’t a bad thing, but how you make that change can make the difference between your product being an option or being relegated to the history books of products that could’ve been.